Yes, that’s right, Adelaide’s about to be rickroll’d! The idea behind a rickroll: someone clicks on a link expecting one thing, but ending up at a vid of Rick Astley singing Never Gonna Give You Up. We’re going to translate this by setting up situations where people will interact with a flashmobber, expecting one thing, then suddenly a group of people will be singing Never Gonna Give You Up! HIT THE LINK BELOW TO READ THE FULL INSTRUCTIONS! WHEN & WHERE: We’ll be meeting at 2:00pm at Hindmarsh Square to run through how it’s all going to play out exactly, but below you’ll get the idea of what we’re up to! There will be three stages to this event, with a number of flashmobs as part of each stage. For each stage, we will have a designated [Rick Astley] who will lead the event. They will be responsible for starting the song (singing the verse solo) and everyone else will come in with a condensed version of the song. unless you want to be one of the Rick Astley Solos, you only need to know the chorus and bridge! This will be full of win. You know those buskers in Rundle Mall that pretend to be statues and only move when you give them money? Disperse around a spot we pick for our busker. We’ll have our Rick Astley as still as a statue with some giant novelty dice at his feet with a sign saying ‘roll me.’ when someone rolls the dice, they’ll start singing. After the song, we’ll all disperse again and wait for the next person to roll the dice (we’ll do this three or four times). You know those people who ask people who ask others to take photos of them? 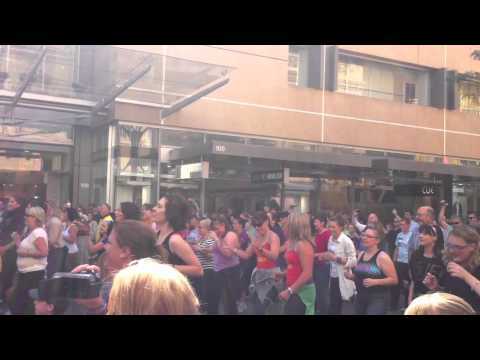 Disperse around one of the Rundle Mall landmarks. We’ll have our Rick Astley ask people to take photos of them with an iconic Rundle Mall landmark. When the person is about to take the photo, they’ll start singing. After the song, we’ll all disperse again and head to the next landmark (Pigs, Malls Balls, Fountain). You know those people who go into shops and buy stuff? Disperse through the designated store. We’ll have our Rick Astley head to the front counter of a store once they’ve looked around a bit and when the shop assistant serves them, they’ll start singing. After the song, we’ll all disperse and head to the next shop (the shops will be announced on the day). IF YOU’D LIKE TO BE A SOLO RICK ASTLEY, POST A COMMENT! « Hairspray Cancelled – New event on its way!